Born in Columbus, Ohio. Lived most of his life in Upper Arlington. Honor roll student in Upper Arlington Schools. Graduate of Ohio State University majoring in Philosophy. Loved the outdoors, managed the old Arlington Golf Course and Indian Springs Golf Course prior to World War II. 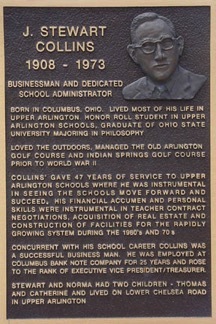 Collins' gave 47 years of service to Upper Arlington Schools where he was instrumental in seeing the schools move forward and succeed. His financial acumen and personal skills were instrumental in teacher contract negotiations. Acquisition of real estate and construction of facilities for the rapidly growing system during the 1960's and 70's. Concurrent with his school career Collins was a successful business man. He was employed at the Columbus Bank Note Company for 25 years and rose to the rank of Executive Vice President/Treasurer.